Bathrooms tend to be ignored when it comes to lighting because they are often misconstrued as being difficult to light. Sure they are typically smaller and more cluttered than other rooms, but that should not stop you from properly lighting your bathroom. 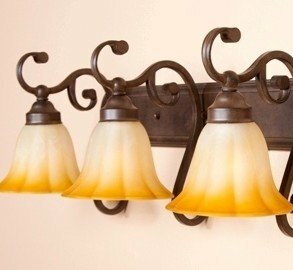 Homeowners tend to leave up whatever fixtures the builders installed into their home years ago, even if that lighting has become outdated or doesn’t properly light up the space. Because the bathroom is where the majority of us get ready each morning, lighting is extremely important. There are a lot of lighting options when it comes to bathrooms, but the easiest, most practical, and by far the most popular choice, is vanity lighting. Vanities are unique in the sense that they are designed specifically for bathrooms. Sure, vanities can be used elsewhere, but their unique design is what makes them the perfect choice for bathrooms. 1. Measure – Vanity lighting comes in many sizes, so measuring your mirror (a few times) is key to ensure that your vanity fits perfectly. 2. Style – Keep the style of your vanity consistent with the style you have throughout the rest of your home. 3. Brightness – Choose a light fixture that will produce the right amount of light for you. To do this, pay special attention to the shade covering the light, as that is where the dimming will come from. For instance, a cream or white shade will produce more light than a tan shade. As long as you pick a vanity light fixture that is the appropriate size for your bathroom, the right style and produces the right amount of light for your liking, you will be happy with the results. Once you achieve the three tips above, have fun with the project and pick something you are drawn to!